In 2014 Channel 4 broadcast a one-off documentary that brought together 10 people with drug or alcohol addictions and associated conditions such as panic attacks, anxiety and severe depression. They had varying musical experience and abilities and the programme tracked the positive effects of working together for two months, playing and composing, and then performing their composition with the London Symphony Orchestra. The Addicts’ Symphony initiative had an 80% success rate in helping the musicians stay clean and sober. Three factors stood out for us in this astounding success rate. The peer-to-peer support granted the participants created a supportive community, and the individuals expressed increased confidence and improved self-esteem. The target of working towards performance in the collective established clear goals and created a sense of purpose. Performing in front of live audiences created a rewarding sense of wellbeing. 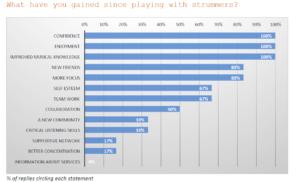 The Addicts’ Symphony demonstrated that a structured musical environment can have transformative effects upon its members, and we were keen to take these insights into related initiatives. New Note Projects, launched in April 2015, uses music to help socially excluded people reconnect and rebuild their lives. The projects are primarily for people who are in recovery from addiction but they also include people who are vulnerably housed and have other mental health issues. musical genre, and there was an eclectic mix of instruments on the go. So our first New Note cycle had an added creativity to it, producing a sort of blend of experimental classical music and rock. It also included beginners as well as professionals, deliberately inclusive. And it really did work for all of the participants/musicians, though there was little if any existing research around on the topic that suggested that it would. Every single musician involved maintained their recovery – despite the odd relapse – and they all said that the orchestra was a vital part of that. New Note Projects, a registered charity, has gone on to expand its activities, starting a guitar group called Strummers – again in Brighton – with a musician as a regular facilitator, and establishing an immediate sense of collective responsibility and the kind of peer-to-peer group support that we saw in the Addicts’ Symphony. enhancing their wellbeing at individual and social levels. We know that this model works for those who have been in the initiative, and with the right levels of support and commitment there is no reason why it can’t work for thousands more people. We have the will. We know the way: we need the partnerships and policies that could give sustained life to what has so far proved to be a life-changing experience and process for many whose life-chances had been diminishing day by day. Next‘Proud employee’ effect: which companies perform four times better in recessions?